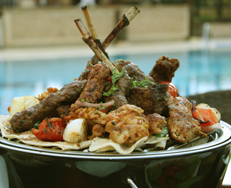 Top: Lebanese Mixed Grill, served at the Four Seasons Hotel | Cairo: chicken, chicken sausage, lamb chops, lamb sausage, onions and tomatoes on flatbread. 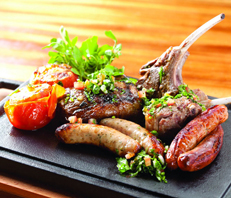 Bottom: A British mixed grill served at The Chophouse | Singapore: beef, lamb chops, different sausages and tomatoes. If you grill, you’ve probably been making “mixed grill” without knowing about it. When you’ve got more than one type of food on the grill—hamburgers, hot dogs and corn on the cob, for example—it’s a mix. Surf and Turf is a deluxe mixed grill. Argentine asado: beef, kidney, liver and sausages such as chorizo and morcilla, a blood sausage, served with chimichurri sauce. Brazilian churrasco: various cuts of chicken (including hearts) and beef (including picanha—in English, coulotte, rump cap, rump cover or sirloin cap). British mixed grill: lamb chops, lamb kidneys, beef steak, gammon (uncured ham), tomatoes and mushrooms. Italian mixed grill: beef and pork plus chicken marinated in olive oil, garlic, lemon and rosemary. Jerusalem mixed grill: chicken hearts, livers and spleen; lamb; onion, garlic and and Middle Eastern spices. Kansas City Mixed Grill (breakfast): bacon, eggs, ham, home fries, sausage links and toast. South Asian Mixed Grill (Bangladesh/India/Pakistan): chicken tikka and mutton tikka, served with roti and chutney. Venezuela Mixed Grill: mixed meat skewers. So today’s tip is: Mix it up this season. Come up with a list of different proteins and vegetables you’d like to try. Lamb Mixed Grill: lamb burgers and chops, asparagus, broccolini and endive. Pork Mixed Grill: bacon, ham, pork belly, pork chops and sausages with corn, garlic, onions and tomatoes. 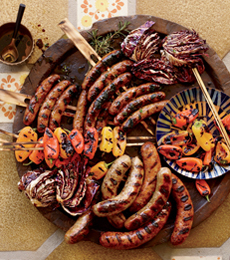 Sausage Mixed Grill: three or more types of sausages with portabella mushrooms and zucchini. Seafood Mixed Grill: shrimp, tuna steaks, eggplant and romaine. Our ideal mixed grill would include duck, lamb chop, lobster tail and pork belly with onions, radicchio and tomatoes. A sausage mixed grill with baby bell peppers. Here’s the recipe from Food & Wine.